This is the third in the Harry Dresden series. Harry's not have a good night and his days aren't the best either. There's this creature going around tormenting ghosts and humans alike, able to get into their dreams and wreak havoc. Harry has to figure out who it is and why while the creatures is slowly destroying people Harry has dealt with in the past. Will Harry figure out who's behind this evil? Will he stop the evil in time? Will he make it out alive? Of course or else there wouldn't be eight more books in the series. Harry does figure things out and rights some wrongs, but there's a price for success. I'd mention what it is, but it might be considered a spoiler. Perhaps in my next review of the series. I do like how Butcher titles his books. Each one has some significance to the story. 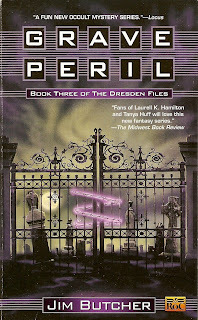 Grave Peril and ghosts; very clever. This one moved a little bit slow for me then ended rather quickly. Loose ends and evil doers were wrapped up in the last fifty-seventy pages and that's with Harry's little side jaunts of memory lane or relating experiences to the reader. I'm also learning to dislike the word "nasty" because it seems to be overused in paranormal books. I'm positive there are other words out there to describe unpleasant, evil creatures. Also, I'm in book three of the series and, as a reader, I'm kind of secure in my knowledge of how Harry's powers work and some of his background. I don't need a refresher course in wizardry and history in each book. Maybe I'm just nitpicking. The plotting and characters are good, I could just do without the extraneous information. Book four should give me more food for thought or maybe I'll just skip over certain paragraphs and the story will move a lot faster. I think I'd like this one, but he had to name his main character Harry? What about Ron, George, or Fred? There's some names never used in literature. His full name is Harry Blackstone Copperfield Dresden. He's named (by his father) after three stage magicians: Harry Houdini, Harry Blackstone Sr., and David Copperfield. Did you know that you can create short urls with AdFly and receive dollars from every click on your short urls.